Tel: 950 281 425 Creative cuisine using local produce, especially fish and seafood. This restaurant set in Almería itself has become more and more popular in recent years. If it is your first visit, try the menu degustación which offers a taste of the restaurant's best creations and is excellent value. Good wine list and pleasant, efficient service. Tel: 950 239 335 Excellent grilled and roasted meats and traditional local cuisine - not recommended for vegetarians because it is very meat-based although some more fish dishes have been introduced into the menu in recent years, especially cod. Very long wine list, good service, home-made bread. Opens evenings-only and closes on Sundays. Simple restaurant overlooking the blue Mediterranean Sea specialised in excellent fish and seafood which gives it its well-earned reputation for having the best quality fresh produce available. Visitors are advised to order one of the many fish dishes on offer, or to ask the advice of head-waiter who will be pleased to advise you on the best catch of the day. Tel: 950 297 156 Restaurant set in a residential complex about 20km from Almería in the middle of the plastic-covered green houses which are so characteristic of Almería but which takes some credibility away from its name Bellavista which means Beautiful view. Classical Mediterranean and traditional cuisine with some modern touches. Excellent wines cared for with skill in the bodega. Also read these tips from Norman Munro who lives in Almería and kindly sent us an email (June 2011) recommending the following restaurants. Cheers Norman!! Meson de Plaza, a bar restaurant in the village square in Lucainena de los Torres, just South of Sorbas. 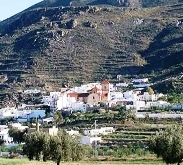 It is deceptively basic, but la duena has a cortijo nearby, and much of what is served comes from there. The menu is very traditional – items like quail, partridge, hare, , cabrito are rotated throughout the week. Most of what you will eat here is home-made. She does NOT believe in shortcuts. Just a short anecdote – my wife and I called in a couple of weeks ago as we were passing through the village to have some breakfast. The usual – café con leche y pan y tomate. When she brought our food, she also brought a couple of pieces of cake, and with a “Try this!” she disappeared back inside. It was delicious, and turned out to be her home made vesion of “Rocque de Aceite”. I asked her for the recipe, she wrote it out and said “Wait!” Back into the kitchen and emerged with a great lump of cake – “Un regalo para ti!” She would NOT accept payment, and as we left, she shyly handed me a bag of eggs “ Directo de mi cortijo.” What can I say. In the same tiny village, ther is a hotel/museum run by a German chef and his Spanish wife who is from el pais vasco. Again, completely traditional on the menu, but food beautifully cooked, real value and quality. Closer to my home, another traditional and EXCELLENT restaurant is Mi Casa in Antas. Modern in appearance, but with – again – a really traditional Spanish menu whose quality is – for a menu del dia – incredible. 10 Euros including drink and dessert, and lots of choice. Primero plato included gazpacho, salmorejo, ensalada de pasta con acietunas negros, lentajes con costilla y verduras, plato segundo with for example, escalope milanesa, ternera en salsa, fritadura de pescado, pollo a la plancha, - and more. All basic, but served beautifully with lovely table linen and cutlery.